Farm maps that are created by using GIS/GPS technology have a number of uses and advantages over old hand drawn maps. A simple base map is useful for record keeping and precise acreage under production. Exact acreage may be important for production records, insurance purposes, sprayer calibration, or pesticide use records. 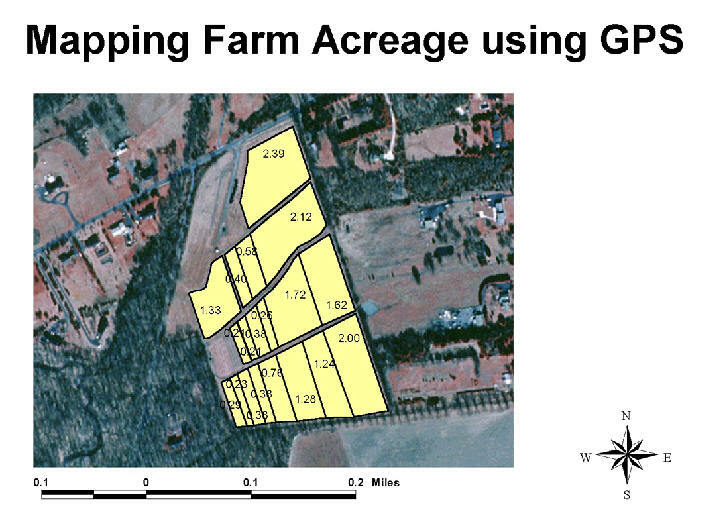 An example of a geo-referenced farm map with exact acreage can be seen in the accompanying example. Geo-referenced maps can be overlaid with different layers of specific data. These data layers may already exist from other sources, or may be generated for a specific site. An example of a map overlay generated from existing data can be seen in a sample map by soil type. One farm may have several different soil types. Knowing the specific soil type may be useful in calculating herbicide rates or helpful in irrigation scheduling. Specific data generated for an individual farm may include a crop variety map overlay as in the accompanying example for a peach farm . These maps may be useful for picking crews, worker protection notification, and u-pick operations.